A friend of mine posted a photo on Facebook of her sons playing with a Montessori Hundred Board that she found at a dollar store. 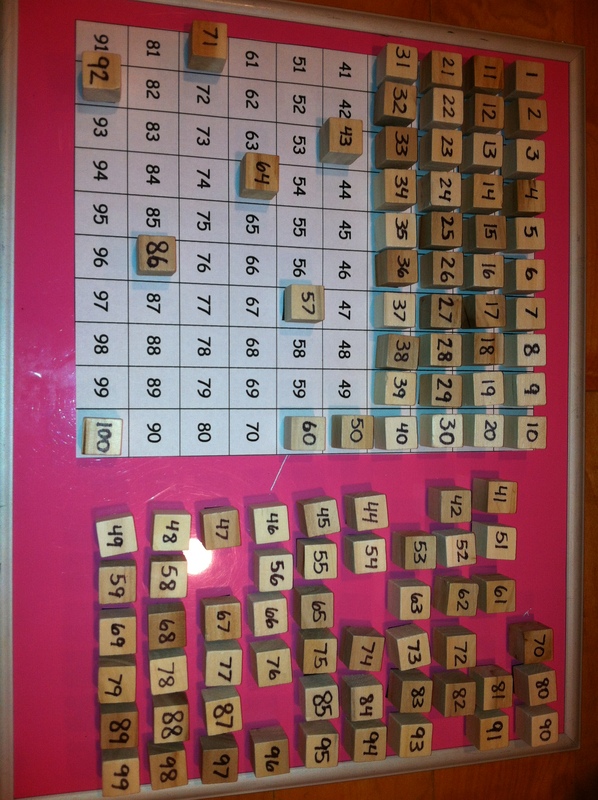 I had never even heard of one, but immediately knew it would be the perfect activity to help M learn her higher numbers and see number relationships. I googled and found some nice wooden hundred boards, but I was hesitant to fork over the $20-$25. I downloaded a free hundred board app, but the free version only went to 25. 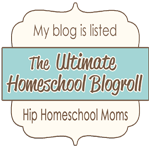 I am rarely willing to purchase an app (I think our homeschooling budget would go through the roof if I started buying apps) and I really thought there was value in working out the board with your hands. So I googled for ideas about how to make one. Obviously, there is a quick simple version of printing a hundred board on cardstock and laminating it, but I wanted something more durable. 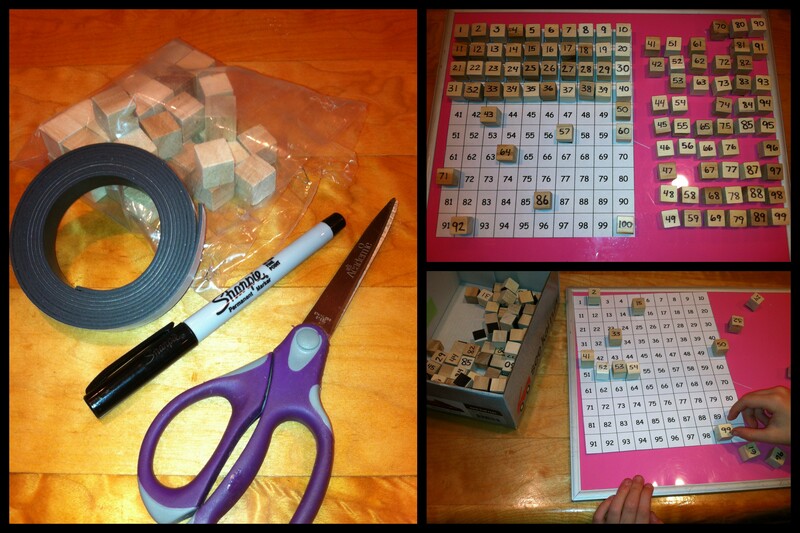 I first got the idea from this blog to add magnetic strips to the numbers. How genius! Magnets would help keep all those tiles in place as one works the board! I wanted something thicker than cardstock or posterboard, so I browsed through my local Hobby Lobby this morning hoping to find some thin wood tiles. I was so pleased when I came across wood cubes, slightly bigger than 1/2″. They were perfect! I had already had cubes in the back of my mind, because reviews of some of the hundred boards on Amazon mentioned how cubes were easier for little hands to manipulate than flat tiles. Originally I was going to print the numbers on some adhesive cardstock I already own, but I decided I would first quickly just Sharpie the numbers on the wood. I figured I could always “upgrade” the wood blocks for a nicer look later. I wanted to finish this project! All in all, I spent about $6 to create our very own hundred board (we already own a magnetic board, but you could use a cookie sheet too). M was so excited to get working on it. And I was so pleased that I made it! M definitely needs work figuring out the numbers; she sometimes will mix a number around, mistaking a 28 for 82, for example. As M started working the board, I realized that I should add a line underneath the numbers; it sometimes made it harder for her to recognize what the numbers were without a line. She quickly realized how to count by tens on the board! First time counting by tens! I was going to add the link for the hundred board chart I printed out, but there is an error on the chart! It’s pretty easy to find a free chart online or make one yourself. Once M is more confident with the numbers, I will give her chart printouts with missing numbers, until she has progressed to a blank 10×10 chart. We will probably eventually play games of counting by twos, threes, etc. If you have any suggestions of games to play with the hundred board, please let me know in the comments! Great idea Mel! I’ve been thinking about doing something similar for Park. My sister’s Montessori school has these cubes that are connected into powers of 10 that are really great because they are tangible and children can visually SEE that 10 lines of 10 cubes equal 100 cubes. Really great work! “LipperLoppy” is a word that my daughters invented. It is usually used as a silly adjective or noun. It's a frequent family joke and a good representation of our family's crazy joyful life.